We are visiting my parents in Illinois. We went to their church today. They have a cute little church where when there are visitors, people notice. It is sort of aggrevating. We know we were the only visitors because they take time to introduce all visitors after the service. My Dad gave the childrens sermon. The majority of the kids up there (5 out 8) were Dad's Grandkids. I am used to our church where we have been members for over 6 years and most of the people there do not know us. 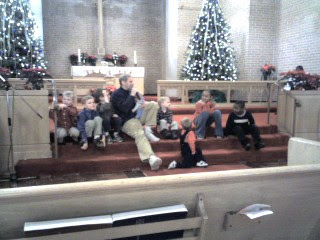 I have never seen a childrens sermon with as few as 8 kids. I do not know if I have ever seen as few as 20 kids up for the Childrens sermon. There are probably more visitors on a typical week at our church than total members today at my parents church. A church with so few members that you can double the kids in a childrens sermon with just one family seems dangerously small to me. It does seem to be a pretty old demographic at the church, so the membership does not have a lot of kids, but still. A church where you can be a member for several years and still very few of the congregation knows your name is probably too big. Part of the reason is that I am not very outgoing and do not participate a whole lot, but still. Anyway, Dad did a pretty good job with the Children's Sermon and the Congregation seemed to think it cute that most of the kids were Dad's Grand Sons. It was actually very cute. We are at the concourse almost 2 hours ahead of time. It gives us plenty of time for a leisurely lunch. We got to the airport so early because of the snow we got yesterday and the nightmare the airport was last year. Last year we gave ourselves almost 3 hours to get through check-in and security and we needed almost every minute. Plus we were rushing so hard that we lost Tyler's carry-on bag. This year we could have taken one hour to check in, one hour for security and one hour to get to our gate. Checking in took less than 10 minutes. Security took 25 minutes. 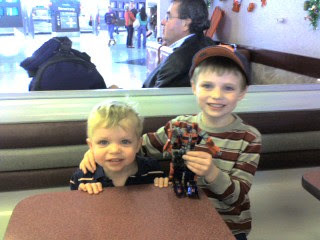 And so we are sitting at McDonalds with plenty of time to spare. It is so much nicer to not have to rush, but it sure would be nice if there was a way to know exactly how long things would take. There is a hotline you can call to get security wait times, but I discovered last year that the posted time is not necessarily accurate. Last year it was probably 45 minutes off. This year it was closer, but still underestimated the wait by 5 minutes. You can check to see if your flight is on time, but they never admit to being late until they actually are late, so that information is pretty much worthless. So between not being able to trust the published information and not knowing how traffic will be (traffic reports seem to be about half an hour later than ever does you any good. ), and the x-factor of traveling with young kids, your only real option is to build in a ridiculous safety buffer between. So this sort of begs the question: if the published information is wrong, isn't it better to not publish it at all? Ironically, it is probably fine 90% of the time... When everything is going smoothly, but it is the 10% of the time when things are not going normally that you most need the information and it seems that is when it is most off. Maybe whoever is in charge of collecting information is too busy trying to correct problems to get timely info on the website or recorded message or radio or whatever. But what good is a security wait time that is off by 45 minutes? Anyway, I am now in Wisconsin. We had an uneventful flight. I am actually typing this while on an exercise bike close to Milwaukee. My goal today is to burn 2000 cardio calories before heading back to Tracy's brothers house. So far I am at 1632, but I am slowing down. I also lifted today so I am probably over 1800, but lifting does not count because the weights do not keep track like cardio machines do. Speaking of inaccurate information, the scale in the mens locker room is obviously off because when I put the big weight on 250 and the little weight on 0, the scale says I am well below 250. When I put the big on 200 and the little on 50, it tells me I am over 250. I hate it when fitness club scales are not properly calibrated, but I have never seen a scale do this before. It does not matter that much, we will call it 250, but it certainly is something to be miffed about as I peddle and type. Someone who exercises as much as I do should not be 50 lbs overweight. I usually lose a good 10 or 15 pounds almost immediately after the holidays. This year I hope to make it more like 25. My biggest problem I think is the beer. I would probably be skinny without beer. And pizza. And lattes. I published photos of the kids on http://kids.ericshepard.com This is the first addition to the website in over a year and a half. You might ask: why even have a website if you are not going to keep it up to date? To that I answer: Shut up. 1810 calories. 90 minutes of cardio. I am getting exhausted. This blog is already too long and boring. I am going to send it up. Tyler's friend Ryan is at our house. Together, they are wild, loud and silly. Connor seems to think they are hilarious. I think they are loud. And weird. I am sort of glad Tyler was not twins. 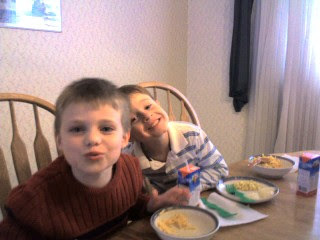 Of course it has been along time since I have had the kind of fun they are having together. And at least no one is crying yet. Their laughing is loud but better than screaming and crying. Their sense of humor is sort of childish. They are acting like kinder gardeners. It is sort of sad that as an adult, I no longer have the ability to have this kind of fun. Oh well... I will just have to live vicariously through my boys. 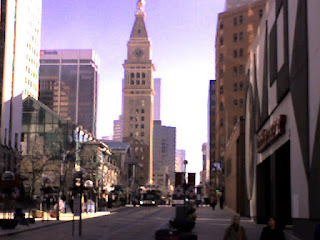 I am finishing up Christmas shopping downtown during what some people would consider lunch time. I do not usually take a lunch hour. I usually just eat at my desk. I probably should take some time during the day especially on nice days like today because it is unhealthy to stare at a computer all day. I am on a web-ex with Captaris tech support. It seems that I have talked to them a bunch over the past couple months and I am getting sick of it. Right now I am on hold. They are having trouble giving me a key that allows me to use their Teamplate server product. I am trying to upgrade from an old version to their newest and it seems like it had been one trouble after another. Now I am on hold and it really seems this should be easier. The guy forgot to ask me for my system id. I am back on hold. The phone CHFA has in here is not ideal for being on hold. It does not have a speaker phone. I cannot mute. It is also a bit of a stretch to get it by my computer and it has to sit in my lap. I am glad I did not have Caparis call my cell phone. I would be pissed to waste my minutes like this. My neck is getting a bit sore holding the phone between my shoulder and ear. I might have to stop blogging because of the pain. The guy is doing something on my computer without talking to me. I hate that. I share this room with 4 other consultants. They are not very courteous about phone calls. This is part of the reason I hate being on Caparis support calls. At the moment all 4 are talking. Does not matter right now since I am ON HOLD. But, it is annoying nonetheless. My neck cannot take this anymore. I am going to stop blogging. Well between yesterday and today I spent almost 2 hours just getting a license key for our development server. It sure seems it should have been easier. 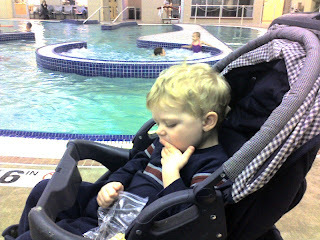 My biggest son is taking swimming lessons while I sit next to the stroller containing my youngest son. I cannot tell what is going on for the lesson. It seems to me that he has had enough lessons that he should be able to swim better. I am proud to say that he is not afraid to go under or get his face wet. He does not take after his mother on that regard. Thank goodness. Last week I was angry at Tyler for horsing around and not paying attention. After my talk with him, he is being much better today. A big part is probably that his partner in crime is not here today. It is just Tyler and a little girl, so he has to pay better attention and there is really no one else to horse around with. The teacher is either with Tyler or with the other child and so there is no real opportunity to get in trouble. I hope my talk with Tyler did some good though. I am probably expecting too much for Tyler's progress. This is the third swimming course he has taken. He is five. And it seems to me he should be able to swim. I feel sort of ripped off. And I feel like I do not work him enough. We do not go swimming that much as a family. Given that Tracy does not have the same disappointed feeling towards his progress, it is probably going to be up to me to get him taught. Because obviously swimming lessons alone are not getting it done. And it makes sense to me that some 'homework' should be part of the learning process. And like I said, I am probably a bit unrealistic on where he should be. Oh well, at least he seems to be having fun. So why do I say Christmas is not really a Christrian holiday? Obviously it should be. It celebrates the birth of Christ. Churches are packed Christmas Eve. All the best Christmas Carols sing of the baby Jesus. Religious Christrians use the day to celebrate their God and how He so loved the world He gave His only son. It is a religous Holiday. The thing is, though, Christmas is so ingrained in the materialistic American culture that it does not seem you have to be a Christrian to 'celebrate' the holiday. I certainly know several people who never go to church but still have Christmas trees and give / receive Christmas gifts. I guess you do not necessarily need to go to church to be a Christrian, but in fact, I specifically know of at least one guy who says he does not believe in God. He still does all those Christmasy things. I also once got a Christmas gift from someone of the Jewish faith. So, we have all heard or read the saying: 'put the Christ back in Christmas.' Obviously whoever says that would agree that Christmas as currently practiced (generally) is missing a necessary part it needs to be an actual religious holiday. Given the number of commercials and ads, you might even call it more of a holiday for retail and commercialism. And maybe the vast number of non-Christians or semi-Christrians is not necessarily a bad thing. Whether or not everyone goes to church or consciencely honors Jesus's birth, it still is a season of giving. Charitable giving is up this time of year. More people volunteer at soup kichtens and so forth. Lots of people spend significant time with family over the holiday. So even if Christ is not in everyone's mind, his Spirit is still around. But still, I think a lot, maybe even most people celebrate the Christmas holiday without celebrating, or even thinking about Christ. Maybe that is cynical. I probably did not explain myself well, but in a nutshell that is why I say Christmas is not really a Christrian holiday. Nonetheless, I am looking forward to it. I'll try to remember to thank God that I get to watch my kids open their gifts and spend time with family that I have not seen in almost a year. Of course they don't. That would be silly. I heard on the radio that Lowes put out their "holiday" catalog. According to the person giving the report, Lowes sells Christmas trees, but in the catalog they called them "Family Trees". They apparently were trying so hard not to offend non-Christrians that they called Christmas Trees "Family Trees". Christmas today is not really a Christrian holiday, so I am not sure why Lowes felt compeled to rename the tree. According to the scale at Bally, where I work out, I was 6 pounds heavier than I was just 24 hours before. Thanksgiving was between those two weighings, so I ate a lot with not much exercise. But, how is it possible to gain 6 pounds that quick? Then, I did cardio for 50 minutes. I weighed myself again and was 3 pounds lighter. How is that possible? It cannot all be water weight, can it? On the way to Bally, I saw people waiting in a huge Friday after Thanksgiving line outside Circuit City. I swear there were more people in line than would fit in the store. I do not care what kind of bargains someone would be able to get, it is not worth that kind of shopping hell. I do not know anyone who admits being one of those people. But obviously they are all over the place. I just do not understand it. Of course I saw similar lines at Best Buy and at the mall as I drove past. There was no line to get in to work out at Bally. It has been a couple weeks since I last added to this blog entry. Right now I am waiting to give blood. Tracy's Christmas party was last night and I drank. For some reason I feel like my blood pressure is up. I feel stressed. I am not sure why. They do not have as many beds today as usual so the wait is longer. It is now Tuesday. I am riding the light rail to work because of snow on the rodes. Apparently a light rail derailed South today so I got on further North where all the trains come together. I was not delayed other than slow drivers because of the snow but I cannot imagine the people who rely on the system being able to go South if I were on of those people I would probably just worked at home today. The highway that runs North into downtown was shut down too, so it was really a mess. Wow the ride is much shorter coming in from where I got on. I am almost there.